Disclaimer: I was sent a free copy of this book from the publisher for an honest review. Thank you Inkitt for the copy! 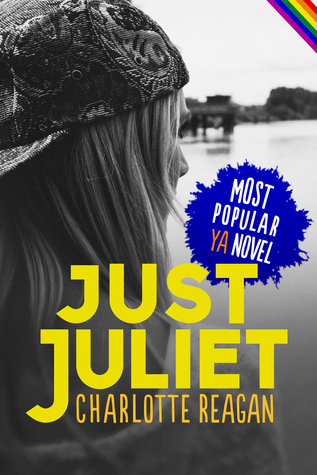 Synopsis: Ever wondered what lesbian love between two teenage girls feel like? Read the story of Lena and Juliet. Currently available for free pre-order on www.charlotte-reagan.com! When I was approached by this publisher to review this book, I was a little hesitant to accept it. I've had publishers approach me in this past, and then a lot of the time, I ended up not liking the book. This was not the case this time. Ultimately I ended up picking this book up because it is an LGBT+ young adult book and there simply isn't enough of those out there. Also, the main character is a bisexual female, how many books can you count that have a bisexual female main character??? I wanted to read a diverse book with hopes that it would be accurately portraying the people it was discussing. Boy oh boy did this book surprise me, and in the best of ways. I don't think I have ever read such a diverse book. This book tackles sexual orientation, religion, mental illness, race, privilege, and other diverse topics I'm probably forgetting to talk about. It felt so nice to see so many people represented in this novel, and accurately too! It's so important that the books we read are diverse and reflect the world around us so that everyone can feel represented. This book was definitely more character driven than plot driven, which is something that I usually hate, but worked for me this time. I loved each of the characters so much. They were unique individuals that all represented a multitude of intersections. There experiences and behaviors were real and you could tell that they were just your cookie cutter characters. While there were some problematic stereotypes in the books within these characters, they aren't so big that they take away from the diversity and representation that is present. My only dislike towards this book was the plot, which is why I rated this 4 stars. There really wasn't a plot. It didn't really go anywhere, and that's okay. You read about these characters experiences and the struggles they go through and that's the important part; learning from their struggles. I did have a problem with the ending. The epilogue tried to cram everything that didn't happen into one chapter, and when I mean everything, I mean like the last five years. It was very rushed, and I wish it would have been splayed out more. Overall, I truly enjoyed this diverse read. I think it's important that there is young adult books out there that represent different people and intersections in our world. and I think it's important that people read these types of books so they get exposure to more than just "the norm". Sorry if this review seems kinda vague, but I truly think this is something you should go into blind. You'll be surprised more and I think that will make the experience all the more better.